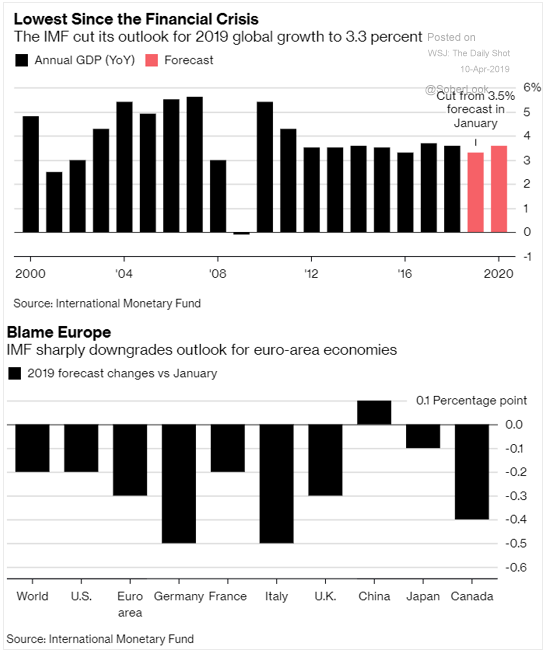 The International Monetary Fund just cut its projection for 2019’s global growth to 3.3 percent from its January forecast of 3.5 percent. That would be the lowest growth rate since the financial crisis in 2009 when the global economy shrank (see chart below). The cause? Worsening outlook for most major economies and higher tariffs decreasing trade. We believe the IMF’s projections are another warning sign for a stock market break this year. It is in line with the fact that stock market analysts have been steadily lowering forecasts for public company 2019 earnings.